I’m not exactly sure what route is the best way to go for teaching kids how to ride a bike. P is on a trike right now. She likes it but the pedaling is a little frustrating for her. Then one day we’re in a store and P gets on a balance bike. She started coasting around. I told D we had to get one for her. So the search began. The bike I saw was in the $250 range and had no conversion kit to then put pedals on when she’s ready. To me that’s a bit pricey for something that may only last her a few months. It did look really cool though. At the store there was a wooden balance bike in the $150 range but she didn’t like it. I checked Craig’s list for a small bike that I could take the pedals off of but didn’t find anything. Then D found a balance bike with a pedal conversion kit on REI. It seemed perfect. 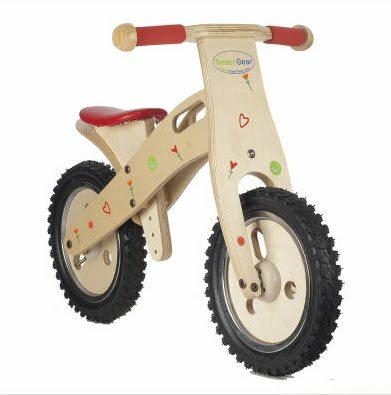 It was the ONLY balance bike we found that could convert to a regular bike later for $140. That feels like a better deal. Then we got it and….it was too big. It says for ages 2-5 but the seat has a minimum height of 16.5 inches. P’s inseam is 14″ high so it’ll be a while before she can use it. I don’t want to wait too long for her to start using a balance bike. She seems to be ready for it. I think acquiring the skill of steering and balancing should come before pedaling, so I’m ok with her not riding her trike right now. She hasn’t been into it since her bike arrived. Previous Previous post: No Kidding.